Located directly off the casino and pool, the entrance of CHERRY night club is accentuated with a hanging dome and beaded chandelier. Guests entering the club will be greeted by a magnificent 7-foot sculpture of red cherries, created by renowned artist Takashi Murakami, which is part of Red Rock Las Vegas extensive contemporary art collection. As you enter the nightclub, a long mirrored tunnel spills out onto the main dance floor and bar, where walnut wood and polished chrome detail the interior. A circular bar acts as the main focal point of the room, covered with a red living glass top. The architectural details enter every facet of the club, down to the provocative design of the restrooms. As patrons enter Cherry Las Vegas night club, they are confronted with what appears to be a holographic wall; two projectors suspended from the ceiling beam an image onto a clear glass with a special film that captures the image. Without the image, the glass is clear and guests can see through to the restroom’s custom washbasin. The surrounding walls of the Cherry bathroom are made up of snakeskin tile mosaics and the doors to the stalls are translucent from the inside out. Shipped all the way from Holland, the gentleman’s urinals are made up of glass, red hot, pouting Cherry lips. Both the Cherry Las Vegas night club and pool deck feature private spaces for guests to enjoy. The club’s interior includes VIP areas overlooking the dance floor; each lined with banquette seating, flat screen TVs and polished steel cocktail tables. An operable glass wall, which can be opened and closed depending on seasonal conditions, separates the indoor club area from the outside pool deck. This pool deck, exclusive from the casino pool, has rotating sun beds and individual daybeds nestled in private areas. A fire and water fountain flows next to the Las vegas hotel swimming pool bar which is lined with back lit onyx. Adjacent to the pool, eight large VIP cabanas offer plasma TVs and stereos as well as refrigerators, fans and private bars. The Cherry club’s entertainment, courtesy of CHERRY’s exclusive house DJs, will provide an eclectic mix of music, with occasional celebrity DJs making guest appearances. All will have access to the most advanced lighting and sound system ever created for a club anywhere in the world — the system took more than a year to develop and months to program. Hours of operation: Open Wednesday - Saturday, 10 p.m. - 4 a.m.
Local ladies are always free. Update: Rande Gerber is developing with George Clooney the Las Ramblas Las Vegas condo development. 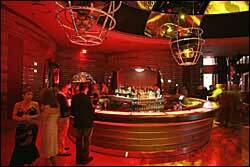 Hip new Las Vegas nightclub, CHERRY, at Red Rock Station Casino Las Vegas.